Little is known of the origins of the famed Jedi Master Yoda (voiced by Frank Oz). For nine hundred years he trained Jedi, ending his days in hiding from the Empire on the swamp planet of Dagobah. In the final days of the Old Republic Yoda was a senior member of the Jedi Council, teaching young Jedi students the ways of the Force until they were old and accomplished enough to become Padawan learners to a Jedi Knight or Master. When the Jedi Council dispatched Obi-Wan Kenobi to investigate an assassination attempt on the life of Senator Padmé Amidala he discovered that a Separatist movement led by former Jedi Count Dooku was readying itself for war against the Republic. Yoda voyaged to the distant world of Kamino to gather an army of clones that had been created for the Republic without the Jedi Council's knowledge, and which had been discovered by Obi-Wan Kenobi. Yoda led the clones to the planet Geonosis, arriving in time to rescue the survivors of an ill-fated Jedi taskforce led by Mace Windu. As the Republic forces conquered the droid army of the Separatists Yoda followed his instincts to a darkened hangar where Count Dooku had fought and wounded Obi-Wan Kenobi and Anakin Skywalker in a lightsaber duel. Yoda and Dooku, both accomplished Jedi warriors, fought an epic duel, using lightsabers, hurled debris and Force lightning. In the end Dooku managed to escape by forcing Yoda to save Obi-Wan and Anakin, who lay wounded beneath a giant crane which Dooku had toppled towards them. Although this first engagement in the Clone Wars was a victory for the Republic the old order was doomed. When the Empire rose to power under the tyrannical leadership of Emperor Palatine, he ordered the Jedi destroyed. Yoda fled to the remote planet Dagobah, where he bided his time. Three years after the Battle of Yavin a young Jedi named Luke Skywalker arrived on Dagobah, guided there by the spirit of Obi-Wan Kenobi. Despite Yoda's concerns about Luke's age and attitude he agreed to teach him the ways of the Force. 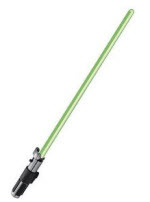 The Master Yoda Force FX lightsaber is available here. Yoda was wise, and tried to share his wisdom with Luke during his training. Yoda's quotes were often succinct. When asked to raise his sunken X-Wing starfighter from the swamp with the power of his mind alone, Luke responded that he would try. "No," scolded Yoda. "Do, or do not. There is no try." Luke did not believe the Force could lift such a massive object. He was proven wrong when Yoda lifted the X-Wing fighter and placed it on dry land. Luke's training was cut short when he sensed that his friends were in danger. He left Dagobah, against Yoda's wishes, to mount a rescue mission. Yoda was concerned that Luke was not ready, and that he would not be able to keep his promise to return and complete his training. When Luke did finally return to Dagobah Yoda had fallen ill. The ancient Jedi master finally died, becoming one with the Force, and eventually witnessing the fall of the Empire together with his spiritual companions Obi-Wan Kenobi and Anakin Skywalker. ©2010 LightSaberGuide.com All rights reserved.